The Psychic Source Membership Rewards Program is a great way to accumulate more dollars in your account for even longer, more satisfying readings. Becoming a rewards member is quick, easy and free. To join, sign up to receive email news and promotions from Psychic Source and you earn rewards on every reading and every purchase you make. To get started, all you have to do is go to the Membership Rewards tab in your account and enter your email address. This will update your communication preferences to include news and special offers emails. You will receive a confirmation email – click on the link in the email, and you’re in! If you have any questions or need help signing up, call Customer Care at +1.800.965.3049. 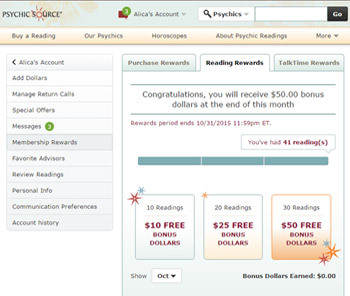 *Your Reward Bonus Dollars expire after 48 months, if you haven’t used your Psychic Source account. *Readings must be a minimum of 12 minutes in length to qualify for Membership Rewards. The number of readings you receive is calculated on the last day of each calendar month. There is no rollover from month to month for the number of readings. *Psychic readings Talk Time must equal 175 minutes to qualify. Your Talk Time is calculated on the last day of each calendar month. There is no rollover from month to month for Psychic readings Talk Time. Eligible for one reward per month. Please note: If you decide to unsubscribe from Psychic Source news and special offer emails, you will be automatically removed from the Membership Rewards Program.